A new paper by Olivier Flores and collaborators came out in July in the open access journal Ecology & Evolution. It offers the first global phylogenetic comparative analysis of leaf mass per area (LMA) – one of the main leaf traits capturing the leaf economic spectrum – across vascular plant species. This is a project I contributed to as part of my Master’s research with Eric Garnier and Olivier Flores. Olivier, then a post-doc in Eric’s lab, was in charge of the massive task of gathering, cleaning and matching both leaf trait data and phylogenetic data for over 5000 vascular plant species, and then analysing the phylgenetic signal across species. Such an ambitious project involved the contribution of an impressive list of co-authors and quite a large dose of hard work and perseverance from Olivier! This study shows that during the diversification of vascular plants, strategies of resource acquisition and allocation captured by LMA appear to have been submitted to overall weak stabilizing selection, generating a low but existing signal of phylogenetic conservatism of LMA. This means that closely related plant species have a weak tendency to share similar leaf economics. 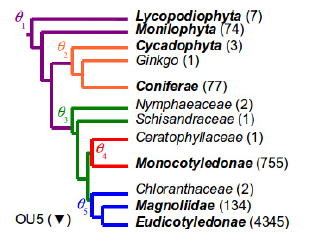 Evolutionary models indicate that the rate of LMA evolution seems to have varied between lineages. 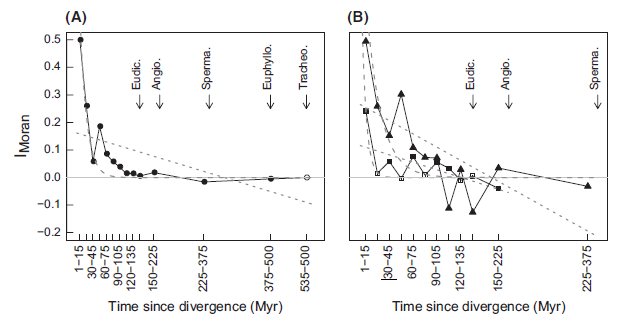 In particular LMA diversification appears to have been strongly constrained and slowed down in lineages of woody plants, with the more recent evolution of herbs and grasses allowing for an increased diversification towards lower values of LMA, i.e. strategies of rapid resource acquisition. Next postWhat’s the difference between an alien and a native plant across a landscape?